Plumtree: The winding route to Plumtree through far western Avery County on U.S. 19 East is the very definition of a road trip. It’s the kind of byway most people would take only if this out-of-the-way hamlet were the destination itself. But for fans of beer and scenic beauty, a thriving brewery and a cluster of outdoor options are enticing reasons to tour the North Toe River valley’s flower-filled fields. The winding route to Plumtree through far western Avery County on U.S. 19 East is the very definition of a road trip. It’s the kind of byway most people would take only if this out-of-the-way hamlet were the destination itself. But for fans of beer and scenic beauty, a thriving brewery and a cluster of outdoor options are enticing reasons to tour the North Toe River valley’s flower-filled fields. Back in the early 1900s, the road was a main route between Florida and the upper Midwest. Highway U.S. 221 later lured that traffic away, but not before Henry Ford and Harvey Firestone dined at a Plumtree tearoom after a stay at the Grove Park Inn. Today, Blind Squirrel Brewery sits across the street from that old eatery and again tempts passersby to pause and stay awhile. In fact, Blind Squirrel Brewery is a growing operation that offers more than just popular suds, which are sold statewide. A cavernous, century-old general store houses a five-bedroom lodge, the taproom, a nano-winery currently making hard cider using fruit from nearby Altapass Orchard, as well as a brewpub, which serves visitors on two large decks overlooking the river. The restaurant is known for major seasonal spreads, including an awesome Oyster Bash the Saturday before Halloween. 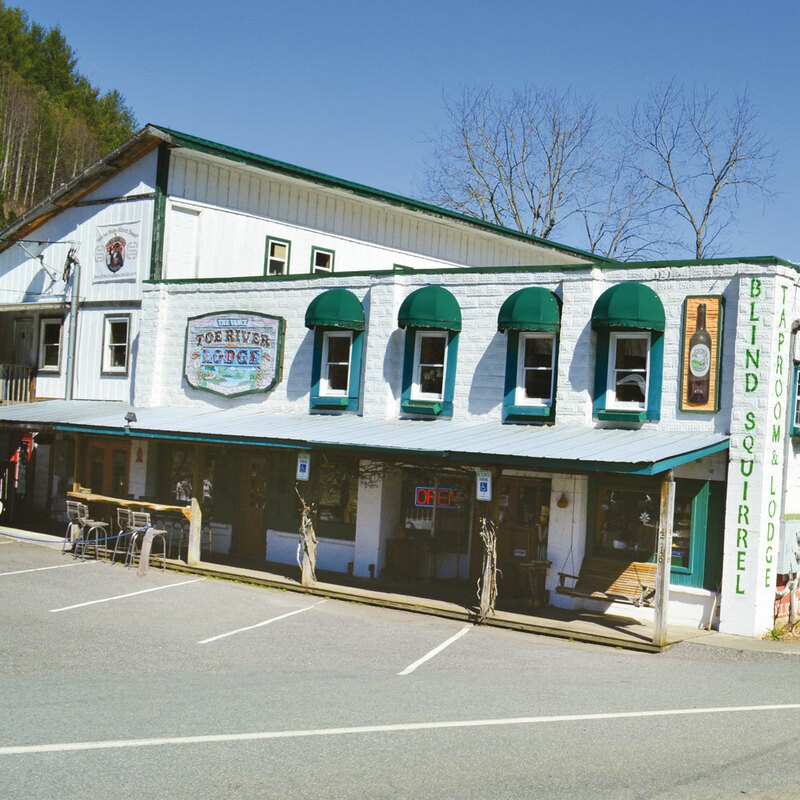 Next to the old general store, the brewery occupies an expanding portion of an atmospheric, 1930s industrial edifice that once housed the Tarheel Mica Company. Free brewery tours with a tasting are offered on Saturdays. And new this spring, brewery owner Will Young and his crew have gone bigger with a relaunch and new name for their 80-acre farm property just a mile down the road. Blind Squirrel Ziplines & Farm Retreat is sure to attract visitors with 11 zip lines and four skybridges, an 18-hole disc golf course, additional lodging, camping and RV sites, and gardens and greenhouses. If disc golf and zip lines aren’t enough to whet the outdoor enthusiast’s appetite, River & Earth Adventures offers tubing down the river, and an array of area hikes await. The Appalachian Trail’s meadow-covered traverse of the Roan Highlands is a magnet for hikers, and Plumtree is a short drive from a lesser-used access point. Find it by heading three miles north of town then taking a left on Roaring Creek Road (and rights at all three forks) to the Yellow Mountain Gap AT trailhead. It’s a mile up the gated Forest Service road to the trail’s Overmountain Shelter and a few tenths beyond to Yellow Mountain Gap, where the Overmountain men crossed the Roans to win the Battle of Kings Mountain in 1780. You can hike that old colonial road straight from the gap back to your car for a loop hike, but first turn right and climb the AT a short way to meadow views. The grassy spectacle of Little and Big Hump Mountains, complete with campsites, are just beyond. And of course, after a day of trekking, the brewery and lodge feel especially welcoming. 4716 S. U.S. 19 E.